BLUEMOMENT • Someone pulled the plug out at Dunstaffnage! 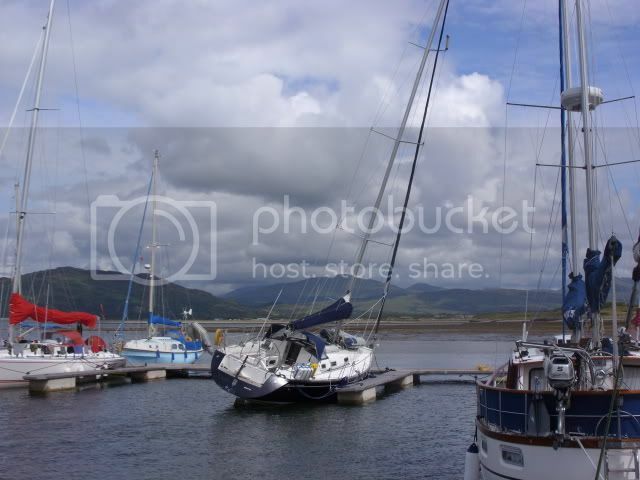 That is a pretty low tide ........ looks like Rosallys mast is still vertical, thank God. Re: Someone pulled the plug out at Dunstaffnage! We were there recently, and a bit disappointed by the marina's reaction to the problem. Only other boat I saw tilted was a victoria quite near Silkies berth. This boat was a bit scuffed on the pontoon two days running, and nobody bothered- it was eventually moved across to the neighbouring finger, so the lumps appear to be very localised. The corner of the carpark nearest the pontoon was underwater at high tide as well. That is really quite shocking - usually Tim is on the ball. I wouldn't expect anymore from the management but I would have thought Tim would have done something. It doesn't look as low as I had thought it might. Did you see how much water was left at the SE corner? Apparently, due to a fairly strong S Westerly, it wasn't quite as low as they had expected. I would imagine the converse was true regarding High Water.